Greg Iles continues the story right where it stopped in book #1 of the trilogy and jumps into action from the get-go. Penn Cage continues his search for true motives behind the death of his father's nurse, even though he begins to realize he will not like what he funds. Meanwhile, Tom Cage skips bail and there is an APB on him. John Keiser, an FBI agent enters the picture as he believes the investigation might help him solve some of the darkest civil rights crimes, including JFK assassination. 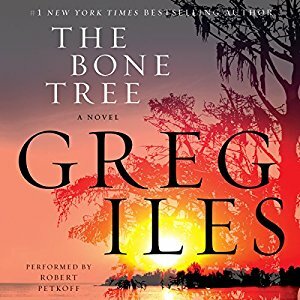 Bone Tree is a solid follow up to Natchez Burning. As the investigation continues, new troubling facts from the past are revealed. A lot of action focuses on Tom Cage and his escape and while reading about his desperate struggles was interesting, I found it a bit too far-fetched at times. His main motivation still remains obscure, which made it easy to sympathize with other characters desperately trying to understand him. In general, I found the behavior of many characters frustratingly irrational. While working towards a common goal, they keep on hiding key information from one another. Each time they seem to move ahead of Double Eagles, some mistake, reckless act of heroism or simple lack of communication cause huge problems. Still, the novel sets up the finale nicely and makes me eager to find out how it all comes together in the end.